Rick: Hopefully, this new job won't let me down. I'm looking forward to a quiet night with several cups of coffee. Double-Faced: I've been watching you, Rick Rogers. Your defense works only against direct threats. I'm not going to hurt you. I'm just going to meddle with time and your imagination. My new job has become a nightmare! My name is Lucas. It's midnight and I'm alone in this creepy mall. I swear, the mannequins are alive and following me, wandering around. I've got a bad feeling. 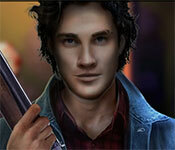 This game has a free trial version, click to start Paranormal Files: Enjoy the Shopping Collector's Edition. If you like it, please buy the full version to support the developer, thanks.